This beautiful 1999 Bentley Azure Tourer features a 6.75L V8 with a single, intercooled Garrett turbocharger, which produces around 360 hp. Imagine, thundering down the road at a top speed of 150 mph. Complete with the luxury items, an automatic transmission, leather interior, power door locks, mirrors, seats, and windows, air conditioning, a cassette player, AM/FM player, an anti-theft alarm, dual front airbags, and traction control, this beauty combines both power and luxury.The Bentley Azure was debuted in March of 1995 at the Geneva Motor Show. In the first year of production, only nine models were produced. However, after full production had started, no less than 251 Azures were finished.The beautiful convertible top was designed and manufactured by the famous Italian designer, Sergio Pininfarina. When the convertible top is down, both the roof and its mechanism are completely and automatically hidden beneath a hide-trimmed tonneau cover. However, this beauty is also suitable for colder temperatures. The Azure’s three layer canvas roof provides excellent sound and temperature insulation. The Azure’s interior is all luxury. This beauty comes complete with the finest leather upholstery, full analogue instrumentation, automatic climate control, straight grain caprails and dash plates, a four wheel anti-lock braking system, an aluminum alloy engine, Wilton Wool carpeting, and lambswool carpet overlays. This Azure also features a painted radiator shell, and 10 1/2″ x 17″ heavy chrome 5 star road wheels. 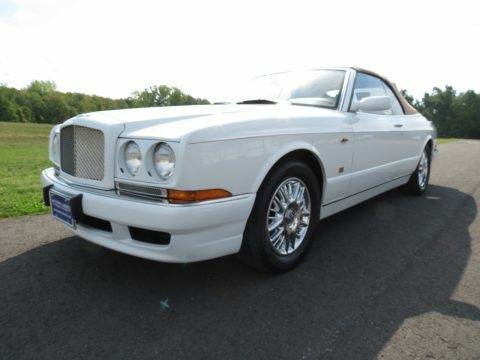 Normally valued at around $109,000, this beautiful Bentley Azure Tourer is being sold for $89,000. That’s a $20,000 savings. With only 44,875 miles, that is a huge savings. Call our office today at (518) 753-7446, or e-mail our transportation specialist: tracy@rolisauto.com. We look forward to hearing from you!